A gorgeous natural oasis surrounded by towering peaks. Your perfect getaway, with every amenity! 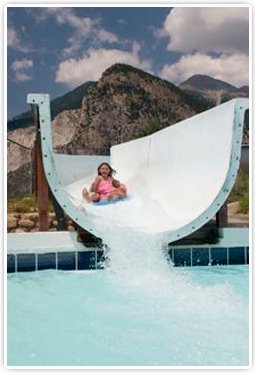 Mount Princeton Hot Springs Resort is where you can do it all. Satisfy your quest for adventure, experience the healing powers of nature, and indulge in pampering spa treatments. Unlimited outdoor recreation alternatives for every interest, in every season, at every level. 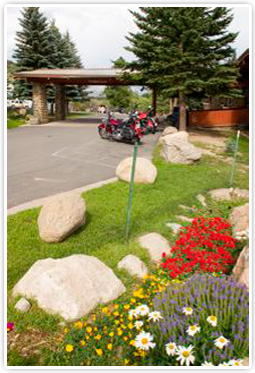 Gourmet meals, choice lodging, and a welcoming staff await you. 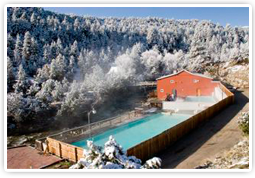 The heart of Mount Princeton is its geothermal springs. Guests lounge in crystal clear, odorless waters reaching 135 degrees, constructing cooling currents with smooth river rocks. Revered by the Ute Indians as a ceremonial bath, these springs also feed pristine pools, complete with a water slide, averaging 95 degrees in temperature. Just one short mile away are the treasures of the Colorado Trail, with bountiful opportunities to hike, mountain bike, and experience breathtaking scenery. Also easily accessible are fishing, horseback riding, whitewater rafting and off-roading, as well as camping in the San Isabel National Forest. Snowmobiling, alpine and cross-country skiing are popular winter pursuits at Mount Princeton. Swimming, tennis, basketball, yoga, and of course a luxurious spa experience await back at the resort. Many guests make the short trip to nearby Aspen or Salida to experience their renown cultural offerings. Mount Princeton is an idyllic site for romantic weddings and intimate getaways, family vacations with activities for all ages, or corporate meetings overlooking a gorgeous valley.